After all the presents are opened and the toys are played with, it’s time to take a break, sit back, and relax a bit. There’s nothing better for winding down than a good read. This is true for us as adults, and it is very true for growing boys as well. The benefits are reading include a greater vocabulary, a boost in self-esteem, and enhanced communication skills. Besides the long-term benefits, in the short term, when your child grabs book and begins reading he begins to relax, calm-down and focus on the present. So after a busy holiday season, an afternoon spent curled up with a good book and a mug of hot chocolate may be just what your family needs to get back on track. The Kingdom Series: The Kingdom Series by Chuck Black takes place in the Kingdom of Arrethtrae where the King and His Son implement a bold plan to save their kingdom; where courage, faith and loyalty stand tall in the face of opposition; where good will not bow to evil. There are six books in the complete series and starts with Kingdom’s Dawn. This series will inspire, engage and fascinate your children from one book to the next. They won’t be able to put them down! 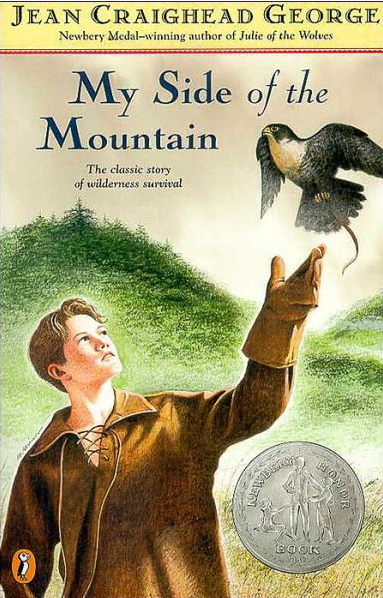 My Side of the Mountain is an inspiring and fascinating best seller that generations of boys have come to love. My Side of the Mountain Series: Jean Craighead George is the revered author of this classic, best-selling series that has been a favorite of boys for decades. Sam Gribley, our boy hero, is terribly unhappy in his family’s crowded New York City apartment. He runs away to the solitude and danger of the mountains where he finds a side of himself that he never knew. This set includes the three books in the My Side of the Mountain series, along with the corresponding outdoor guide. Books included are: My Side of the Mountain, On the Far Side of the Mountain, Frightful’s Mountain, and every boy’s favorite – the Pocket Guide to the Outdoors. Robot Wars Complete Series: Set in an experimental community on Mars in the year 2039, The Robot Wars series features 14-year-old virtual reality specialist Tyce Sanders. Life on the red planet is not always easy, but it is definitely exciting. Tyce finds that the mysteries of the planet point to his greatest discovery-a new relationship with God. He talks about his growing faith and curiosity in a manner that kids can relate to as they are probably wondering some of the same things. Each book contains two exciting adventures. These books are recommended for ages 10-14 years and are perfect for the sci-fi lover in your house!